This award-winning film, narrated by Whoopi Goldberg, examines a little known aspect of American history, when newly freed slaves throughout the South formed benevolent societies to respond to abject hunger, illness and the fear of a pauper's grave. The Fair Hope Benevolent Society in Uniontown, Alabama, provides an unprecedented look at the complex and morally ambiguous juxtaposition of the Society with the worldly pleasures of what has become known as the annual Foot Wash celebration. 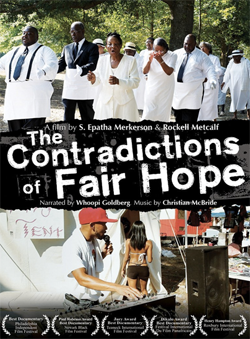 The Contradictions of Fair Hope DVD review by porfle. Click here.